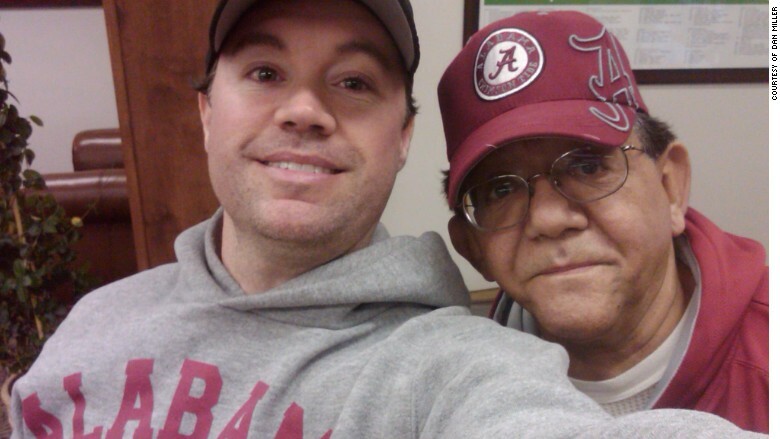 Dan Miller, left, in University of Alabama football gear with family friend Louis Nieves. Danny Miller loves investing and Alabama football. So far this year, Miller and the Crimson Tide (4 wins, 1 loss) are rolling over the competition. But unlike the aspiring football pros at Alabama, Miller didn't grow up aiming to be an all-star trader. He never worked on Wall Street. He didn't even take a finance class in college. Yet he and his childhood friend Jason Robinson are beating Wall Street pros on estimating Corporate America's earnings. So far this year, Miller and Robinson's earnings estimates are more accurate than the Wall Street consensus 63% of the time. That's according to Estimize, a website where anyone can predict earnings and see how they stack up. Beating the Wall Street consensus is a big deal. When companies announce earnings, they're often judged a success or failure based on whether they beat what "the street" says. So estimates can have a big impact on a stock's performance. But people like Miller and Robinson show that Wall Street often gets it wrong. "A lot of it is just gut instinct," Miller told CNNMoney. "The common guy, if he does his homework and enough research, he can do just as well as the pros." Miller and Robinson like digging into the numbers of companies such as Apple (AAPL) and Gilead (GILD). They made 30 estimates in the second quarter alone. They use that knowledge of how businesses are doing to inform what stocks they buy personally. Miller recently beat Wall Street's estimate on biotech company Biogen (BIIB). He estimated the company would have earnings per share of $4.26 while the Wall Street consensus was $4.11. Biogen reported EPS of $4.22 -- meaning Miller's guess was more accurate than Wall Street's. Robinson, 38, sells garage doors and Miller works for an environmental lab services company. Robinson is the macro guy, studying bonds, the economy and the Federal Reserve. Miller gets in the weeds on earnings and balance sheets. Then the two consult on estimates. They also have one other key difference: They root for different teams. "He's an Auburn Tiger [fan] ... there was a lot of smack talk at the beginning of the season," says Miller. When he's not watching Alabama football or doing hot yoga in his free time -- "I'm a hot yoga fanatic!" -- Miller runs an investing blog, Wall Street Bean, which shows his "Bean Screen" winners. The screen is an excel spreadsheet algorithm he and Robinson computed to filter companies that meet their standards. 2. Strong earnings per share (EPS) growth. 3. A low valuation (P/E ratio) compared to industry peers. 4. Solid margins (between sales and profits). 5. Little or no debt. Chipotle (CMG), Apple (AAPL) and Boston Beer Co (SAM). (Sam Adams) are currently on the Bean Screen, though some like Chipotle don't meet all the requirements. Miller is big on biotech stocks too. He doesn't watch financial TV anymore -- "CNBC, it'll just drive you crazy in the morning." 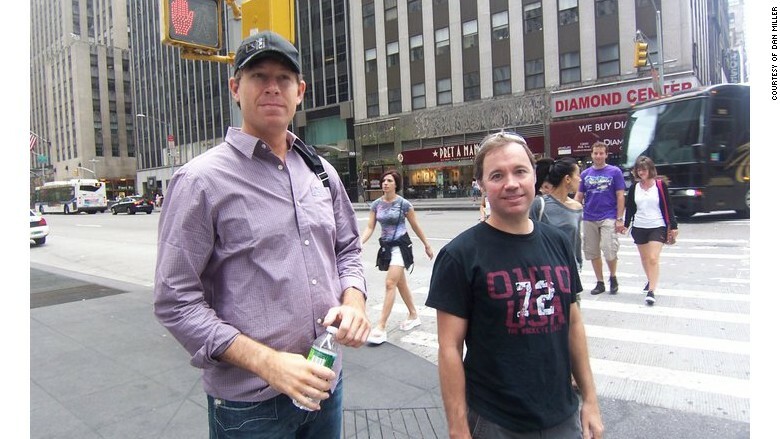 Jason Robinson, left, and Dan Miller are childhood friends who invest together. They recently visited New York. Miller, who is 40, unmarried and has no kids, admits he has more time than the average retail investor. He doesn't like giving out investing advice, and he suggests other investors with less time go into safer investments like mutual funds. Still, he has zero professional experience and has no desire to get into finance. "It would be too stressful" to be an analyst, says Miller. His experience "goes to show that you don't have to be a Wall Street analyst to be an expert on earnings estimates." Miller's interest in investing stems from the one time he got burned bad: the dot-com bubble. He was fascinated by the internet boom while studying at the University of South Alabama. But the fascination ended quickly when Miller's $3,500 in stocks dwindled to about $350, he says. The experience taught Miller that if he was going to invest in individual stocks, he would need to do more research. "When that went bust, that little I had went bust too," says Miller, who says his stock investments add up to $150,000 now. Miller may not be comfortable dishing out investing tips, but every fall he has one comment for friends and followers of all stripes.